I’ve considered Kobalt but the draw slides appeared to be a bit too flimsy. That is one reason you see binding on that wide drawer. Higher quality slides would have been able to handle any flexing from that drawer. I’ve been looking at some of the toolboxes offered at Costco. They have similar stainless steel boxes that are comparable in price but seemed to have better quality. The drawer slides were definitely more beefed up..
You’re right, the drawer slides could be a bit better, but they’re only an issue with the widest drawer. 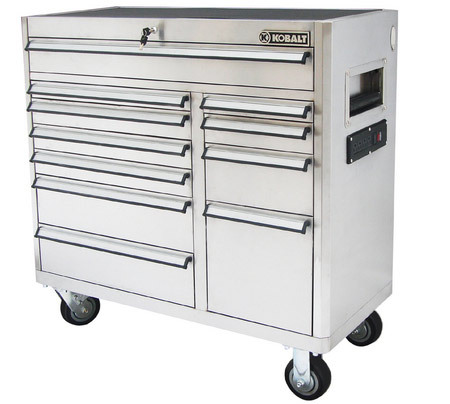 I haven’t seen Costco’s tool chests, but their website paints a pretty picture. It’d be fun to stroll into the store with a hundred pounds of lead, load a few drawers, and see how they roll. If I ever amass enough tools to need a second chest (which is inevitable), I’ll keep that Costco box in mind. But I’ll miss my extra-deep fluids drawer. I have owned this toolbox and do a lot of mechanic work at home (rebuilding engines and such), and this toolbox has been excellent for me. Its about the cheapest unit you can find with all ball-bearing slides, but I wouldn’t put the chest in the classification of “low quality”. I found that spraying the slides with WD-40 every 6 months or so makes them slide MUCH easier, and non of the drawers feel uneven or flimsy to me, they all seem to be able to hold their rated 100 lbs. The only complaints I have with the chest is that it didn’t come with a proper work surface (I screwed a 3/4″ sheet of plywood to the top and fixed that), 3 of the bolts for the casters didn’t install correctly (bad threads), and the top drawer should be about 1/2″ taller to accommodate deep sockets better with my Hanson socket organizers which I love so dearly. Overall I think the chest was GREAT for the money and would recommend it to any DIYer. I bought what I thought was a well built tool chest have had the box about two years and the drawer slides are falling out of it and it is not overloaded. The slides are made of plastic so if you use the box daily as I do they tend to wear out. I would not buy another one.